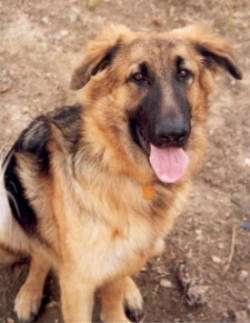 Noel is a 1 year-old female German Shepherd. Noel is a genuine sweetheart. She was found recently by a good samaritan who took her to the vet, and worked to get her a place to stay. We don't know much about Noel's history beyond that. We do, however, know that she has a wonderful temperament. She shows no sign of dog or people aggression. She is pretty young, and is just starting to figure out how all of her body parts can work together to prevent her from tripping all over herself. As you can see from the photos, this girl is very distinctive-looking, what with her floppy ears, but despite her ears not being on point, everything about her is German Shepherd down to paws. She would doubtless make some very fortunate person a wonderful pet.